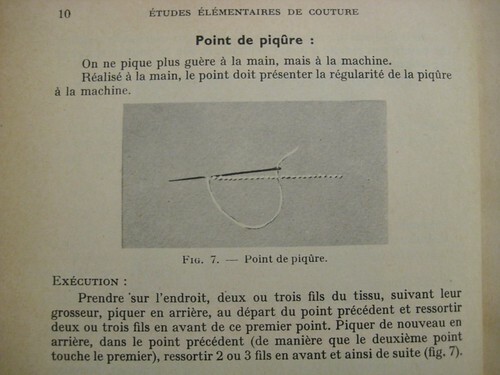 Tonight I’m sharing a few excerpts from a French vintage sewing book: Initiation à la Couture Familiale (it could translate as “Introduction to home sewing”). It’s actually a series of two books from 1960 and 1961, which were intended as school manuals or for the home sewer which didn’t have the chance to have sewing lessons at school. They were supposed to give girls and young ladies good fundations to sew quality garments. I found them at the Forney library (a specialised library in Paris devoted to craft, fashion, design and such which I adore, lots of interesting books there. Definitely check it out if you live in Paris or nearby!) some time ago. It’s funny to read the foreword now, because we don’t study sewing or any other home related matters in school nowadays, so it seems very dated when really it wasn’t such a long time ago. My mom had sewing lessons at school in the 60s and I didn’t in the 80s. I personnaly think it’s a shame, every boy and girl should learn some basics in sewing, knitting, cooking and such, it would be very useful! 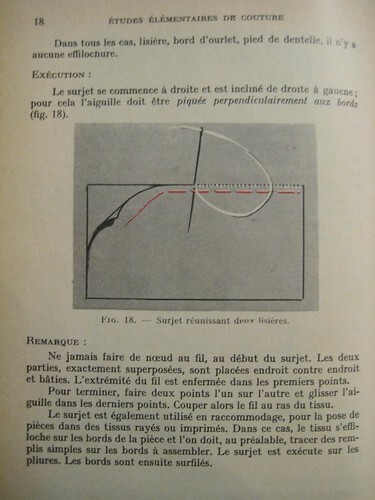 The text I’m showing you here is from the first section of the first book, teaching different kinds of stitches. By the way if you’re able to read French I suggest you read the French version of this article, because it’s a bit more comprehensive. The reason I’m sharing those pages today is because when reading this it struck me as delightfully old-fashioned. 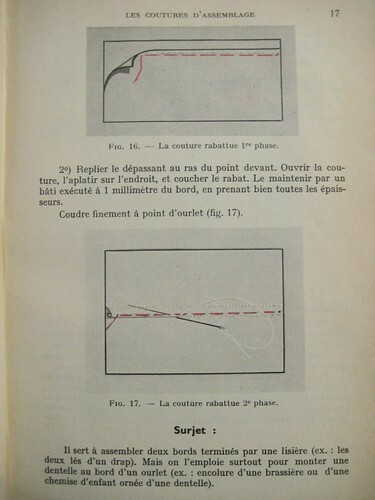 About the simple stitch is says that “We no longer stitch by hand, but use a machine”. Who would think it necessary to clarify this nowadays? All the other stitches are explained as hand stitches, and are supposed to be done this way. Including the overcasting stitch. 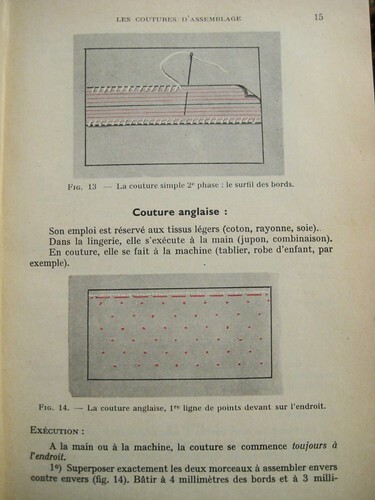 A modern book would explain you to use your machine zigzag stitch or use a serger if you’re lucky enough to have one… They also make a difference between regular clothes and underwear, mentioning when a stich or seam finishing (pictures below) is more adapted to lingerie. 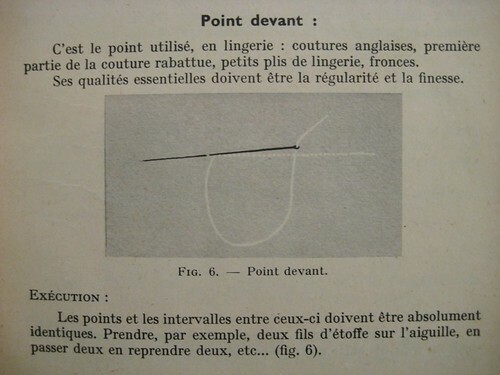 I haven’t seen many modern book talking about lingerie stitches or seam finishes, except if they’re devoted to this particular subject. Who wears those fine and fancy petticoats and slips today? A few vintage fashion lovers. I do love slips, I find them very elegant and feminin and useful, and I think they are very pretty objects, but judging from how hard they are to find I guess they are not many of us. And among those, who take the time to sew them? 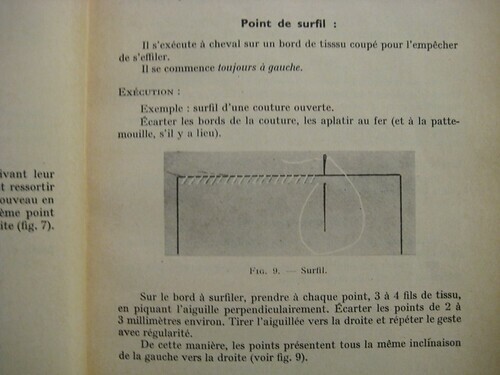 Those pages are from the section describing the different types of seams. There again most of them are made by hand, and they point those that are useful for lingerie. I also like that cotton fabric isn’t the only or even the main fabric mentionned here. I feel like wools, rayon and silks have a more central place. That said and old-fashionness put aside, those techniques are still totally appropriate today, whether you want to sew by hand or to adapt them to using a sewing machine. My sewing machine has been brought to the repair shop last week. I was hoping to get it back yesterday, but sadly we have only one car, my husband is working this week-end (and goes to work by car) and they called me too late in the morning for us to go before he left for work. Since I can’t go during the week, it will be another week without my precious sewing machine. To make up for the lack of completed sewing projects, I’m going to share some vintage cuteness. Before I show you some outfits pictures, I wanted to introduce you to the magazine they come from. 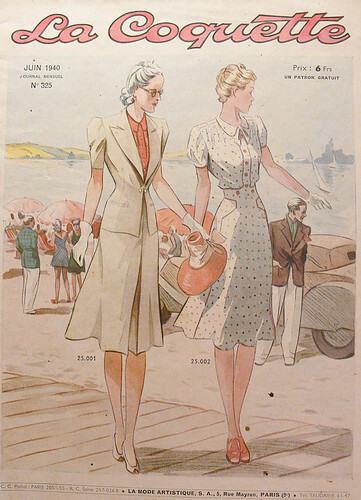 It’s a french magazine called “La Coquette”, and I own to issues, one from 1940 and one from 1954. This magazine is a collection of pattern illustrations. Women could then order those patterns using the given references. 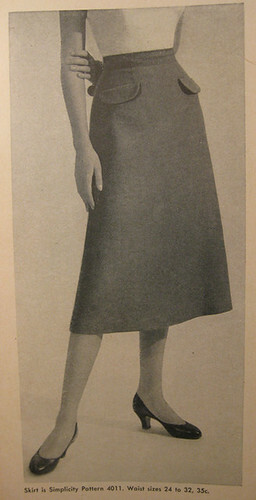 They were available in standard sizes or made to the customer’s exact measurements. The company even had sewing mannequins available for sale. There are also a few knitting/embroidery patterns given directly in the magazine. Inside La Coquette you could find a ticket to get one of the patterns for free. 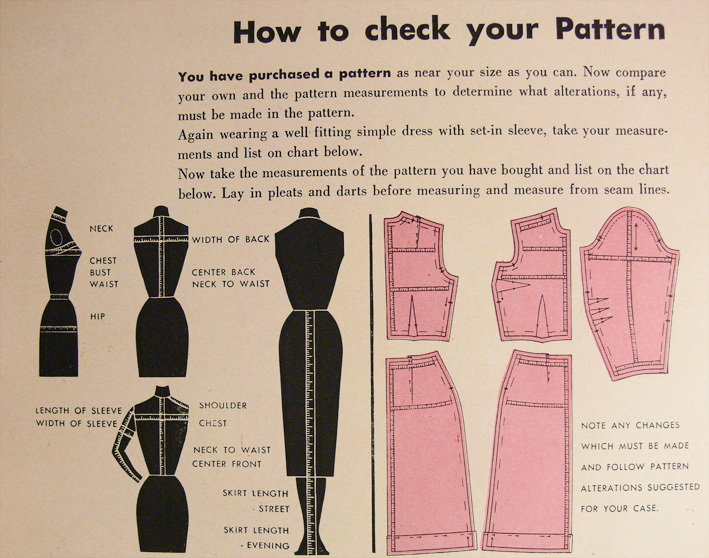 Some useful pieces of advice, especially for those who use vintage patterns. I was especially interested in the little bit about chest measurement vs bust measurement. 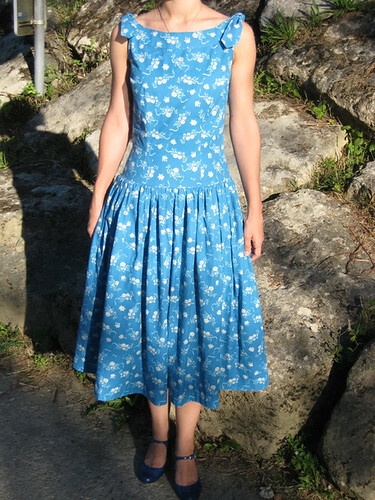 It confirms what Gertie wrote about here and might explain why the pattern I used for my blue dress was too small. 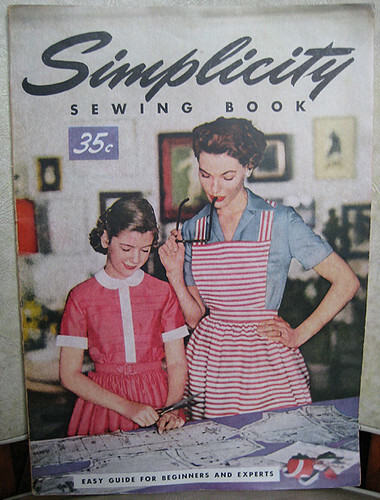 Here is my first post around the Simplicity sewing book I talked about last week. I’m starting with the few outfit pictures you can find in the book. If you click on the picture you’ll go to their Flickr page where you can view them in bigger size. Recently Barbara from Moxie Tonic was organising a give away on her blog. 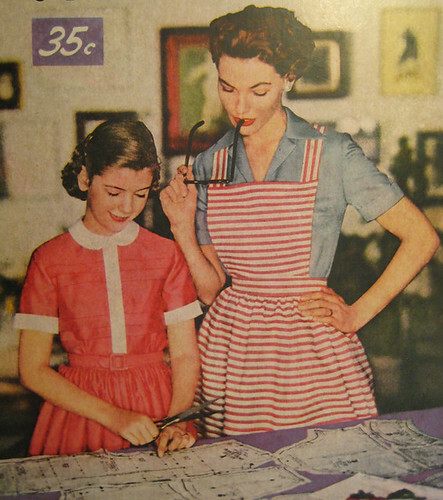 She was offering two sets of two vintage sewing books from the 50′s. I’m right in the middle of a crave for inspiration from that time, so I took part in the give away… and won! I was surprised and really happy. I couldn’t wait to get the books. 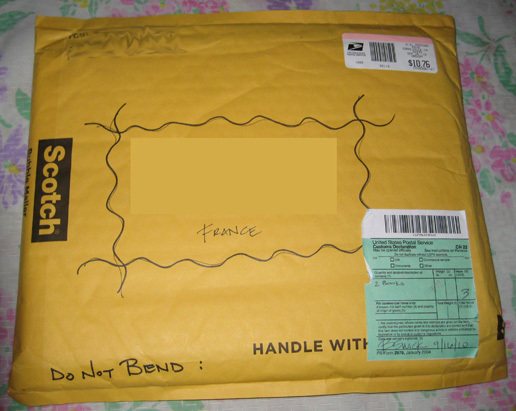 I got the package at the end of last week. I had the pleasure to receive those two books: “Simplicity Sewing Book” from 1953 and “Singer Student’s Manual of Machine Sewing” from 1954. I didn’t have time to read them entirely yet, but you can guess that I had a first look at them right away! 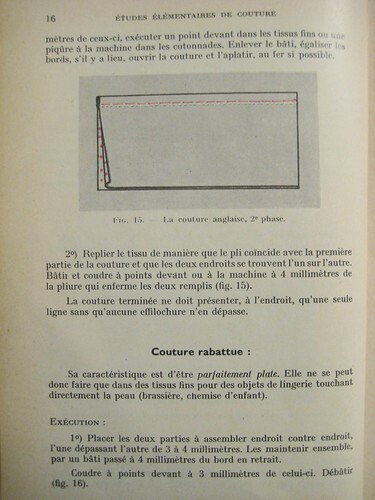 I was thinking there would be more pictures or drawings of actual garments than there actually is. But they’re quite interesting even without much outfits being shown. Less inspiration, but useful tips! I already learned a few things from the Simplicity book. 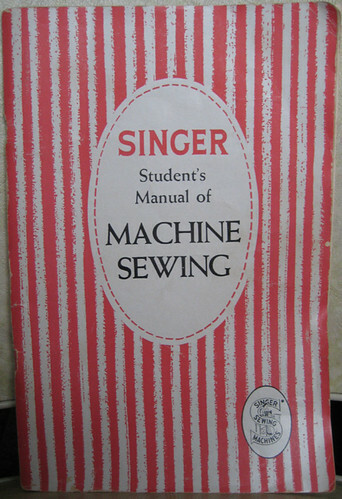 It contains the usual sections of a sewing book: choosing a pattern, alterations, sewing techniques… I haven’t read much of the Singer one yet. It’s really more oriented towards using and maintaining your sewing machine. It might proove itself usefull if my dream of getting an old sewing machine is fulfilled. Of course I’ll share a few pictures from those later. 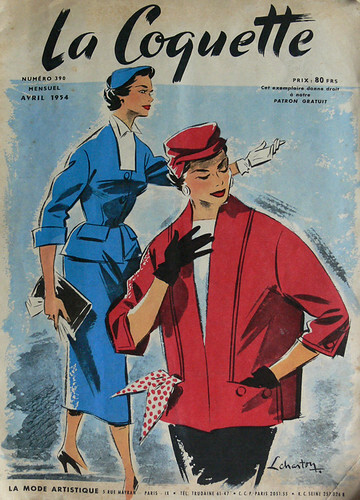 ^_^ And since I’m in this “I want vintage inspiration” mood, I’ll have other vintage publications to share with you! Sorry I didn’t write the past weeks, I have things to say but sad things happened and I wasn’t really on a writing mood. To get slowly back, I wanted to add a side note about pattern Simplicity 2101: the ties at the shoulders are “fake”. They’re not part of the yoke, you just tie them on top. In the first picture I showed of the dress, it is shown without ties. The good thing about this: you get two tops in one, since you can wear it with or without the ties. And you can use them to make sure your bra straps won’t show, since you can catch them in the ribbon and ties them to the yoke. I find it very useful with such a wide neckline. The bad thing: I find they have a tendency to move (go too much to the back or the front of the dress) and untie themselves. I had to move them back or retie them several times during the day. Here are the pictures! ^^ We did a little photoshoot last Sunday. This dress was quite a challenge! First, because I had a firm deadline for it. That’s not a good idea. When you start you’re very confident, thinking you have plenty of time, and then things happen, you realize you have to make a lot of alterations to the pattern, and suddenly you’re late. Because the bad joke was that the pattern is too big! Seems it’s not my size after all. 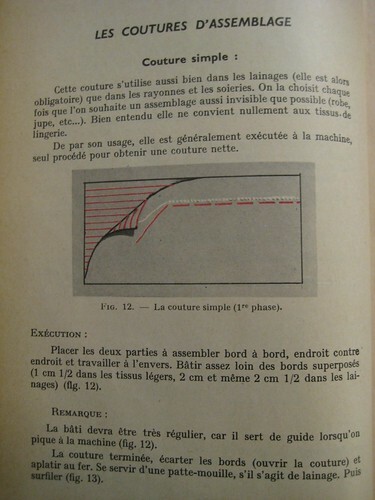 I see several possible reasons: converting my measurements from cms to inches, matching with the closest (but not exact) measurements on the pattern sheet, choosing a vintage pattern rather than a modern one… And now the result is here: it’s too big, and I got several patterns in the same size! 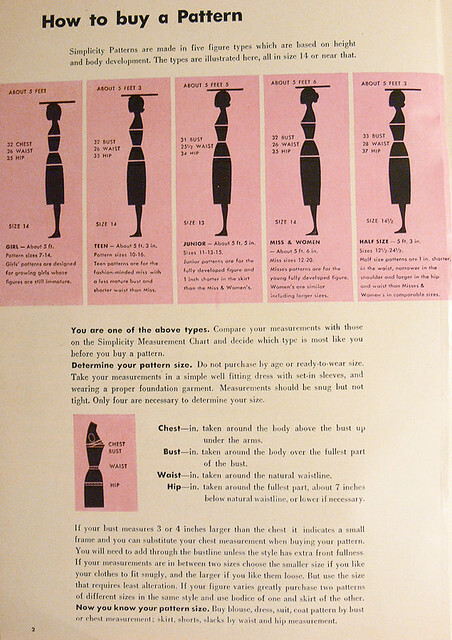 Gertie wrote a post on finding the good vintage pattern size (which I saw afterwards…), in which she suggests you use your high bust measurement and not your regular bust measurement. Anyway next time I’ll order one size smaller! So in the end a lot of changes had to be made: I took in a few cms in the middle of the back and front pieces, at the sides, at the shoulder seams of the yoke… Because of that I had to redraw the armhole, and with no notions of pattern altering it was a little scary. I made a musling of the Simplicity pattern (top of the dress), which seemed okay, but in the end I find that my dress is a tad too big. The waist and hips could be more fitted. I wonder if I did something wrong or if the fit could have been changed by adding the skirt. 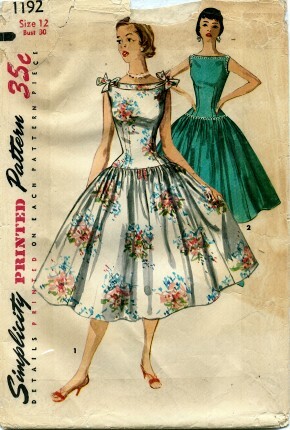 I saw in another vintage pattern (for a real dress) that they add a grosgrain ribbon as a waist stay, I’ll try that and see if it’s better. Another alteration I did was to change slightly the placement of the side zipper: it’s supposed to be at the bottom of the blouse, but for a dress I thought it would be better to have it at the top, just under the arm. The last thing that happened, which I hadn’t planned, was with the armhole. They say to finish it with bias tape, but it was just impossible for me! I couldn’t turn it around. I had to draw and add shaped facings instead. Now let’s talk about the good things! I’m really happy I made this dress. And doing this lead to many first times:- first 50′s dress (and first garment made from a vintage pattern! )- first invisible hem (done with my sewing machine)- first lapped zipper done with my sewing machine- first close-fitting garment (and first time sewing darts)- first gathers done with my sewing machine. I didn’t use a gathering foot to make the whole gathers by machine, but I basted the gathering threads by machine. It was quicker and the gathers are more regular than when I do it by hand!I even used my sewing books four times: for the armhole facings (to do them perfectly), for the zipper, for the invisible hem and for machine gathering. It’s nice to feel you’re making progress. I’m back! Many things happened after my last post that prevented me from sewing as much as I wanted and bloging. Some nice things, like birthdays or friends visiting, and some not as nice, like a cold and headaches (I’ll let you decide where “working late” belongs). But in the end my last project was completed, on time for the wedding it was intended for, which was last Saturday. I don’t have nice pictures of the dress on me yet, so this is the only picture you’ll get for now. 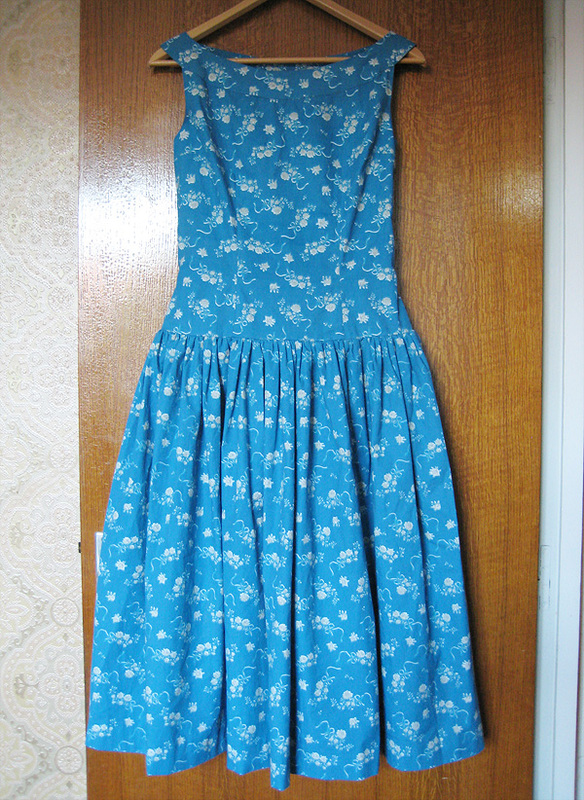 My challenge was to make a pretty dress from the 50′s. I had decided that for this wedding I’d make my dress myself. And since it had to be nice and elegant (I lile to be dressed up for weddings, in honor of the bride and groom and to make it a special day), I logically turned to the 50′s. To me women clothing of that decade is the most elegant and feminin. For this dress I used view 4 of the pattern shown in my last post, which is actually a blouse pattern. It’s Simplicity 1201. I’ve had my eyes on it for some time, I like its fitted shape and the different necklines. All variations are really nice. When I found it for sale in what seemed to be my size while I was looking for my dress pattern, I decided to get it and transform it into a dress by adding a skirt. I did a little research online to try to get more information. Camelia Crinoline has this pattern and made the dress, you can find it here. She very kindly answered my questions about the fabrics and measurements. After that the challenge was to find the right fabric. I was one of the two bridemaids and we wanted to match as well as look ok with the bride without wearing the same color as her (navy). Turns out it’s really not easy to find a nice blue fabric that is not navy, baby blue or turquoize. I finally found this one in Dunkirk, and I’m really happy with it. I hope to show you more pictures later, along with construction details. 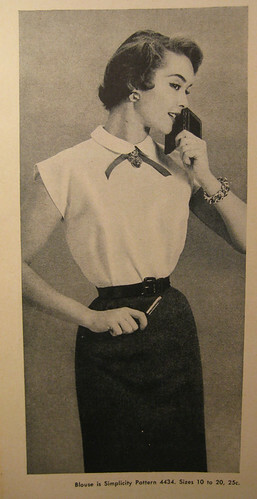 In the meantime, if you’re interested in vintage clothes you can go check Sew Retro. 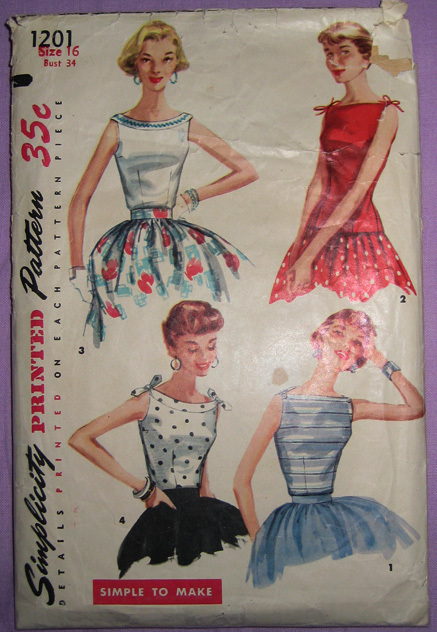 It’s a collective blog about vintage sewing.